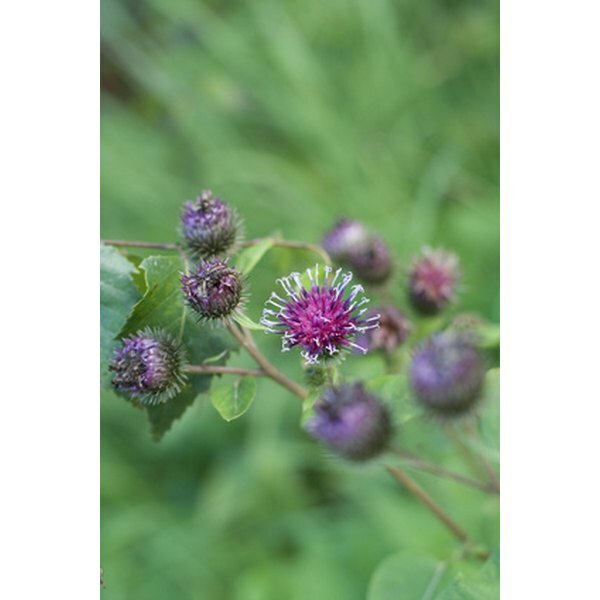 Burdock is an herb that was first used in the 14th century by European herbalists to treat leprosy, according to Michael Castleman, author of "The Healing Herbs." In the following centuries, herbalists recommended burdock for a variety of ailments and conditions, including ringworm, gout, syphilis, acne, psoriasis and skin infections. Some modern alternative medicine practitioners believe that eating fresh burdock root may provide health benefits. Using burdock root is not a replacement for conventional medical treatment. Consult your doctor before taking this herb. According to Castleman, fresh burdock root contains a chemical called polyacetylene that may have antibacterial properties. Burdock root is considered particularly useful for treating skin infections and urinary tract infections. Some medical researchers also believe that the antibacterial properties of polyacetylene may may help alleviate the symptoms of gonorrhea, according to Castleman. Polyacetylene may also possess antifungal properties, according to Castleman. Some herbalists believe that fresh burdock root may help people with ringworm, a fungal infection characterized by round, red patches on the skin. Fresh burdock root may also be useful for treating tinea versicolor, a fungal skin infection that typically appears on the shoulders, neck, chest, back and face. Fresh burdock root may also offer other benefits, according to Dr. James F. Balch, author of "Prescription for Nutritional Healing." Polyacetylene and other chemicals in burdock root may help clear toxins from the blood, and may support liver and gall bladder function. This herb is considered an immune system stimulant. Burdock root may interfere with the body's ability to absorb iron from foods and supplements, according to Dr. Balch. Also, burdock root is considered a uterine stimulant and should not be used by pregnant women, notes Castleman.